Today at the Xbox E3 2015 Briefing Rare shined as bright as they ever have. Microsoft’s slogan this E3 was a promise to have the “greatest games lineup of all time” for Xbox. Microsoft delivered on that promise by honoring Rare’s legacy. About halfway through the briefing a trailer started in darkness. One-by-one, banners appeared around the room: a Joanna Dark banner, a Battletoads banner, a Banjo-Kazooie banner, an R.C. PRO-AM banner, and a Conker’s Bad Fur Day banner. Each banner was met with mighty cheers from the crowd. 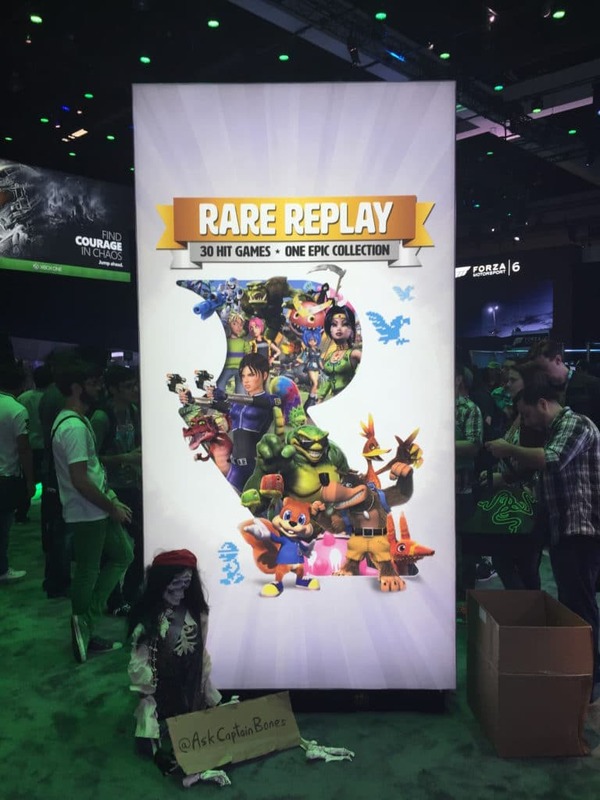 Then, the Rare Replay collection was announced, a collection with 30 classic Rare games for $30 dollars. To this, the crowd boomed! 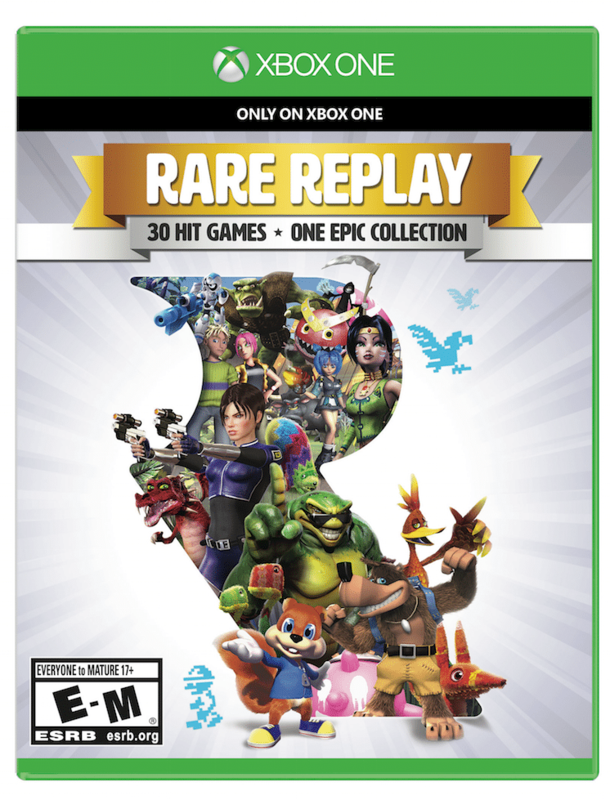 But Rare Replay has so much more than 30 of their best games. After the briefing, I got to play the Rare Replay myself. Rare Replay’s menus and UI are gushing with polish and charm. Just wait until you see the intro video to the game. It is absolutely marvelous, and every second of it fully embodies Rare. You can definitely tell how much love from the team has gone into this game. The game is presented like a theater with curtains and stage. Each game in the library is identified as a character(s) from the game in paper, cut out, puppet form. For instance Joanna Dark looks like a cardboard cut out with her arm dangling at shoulder joint swaying back and forth. I only stopped smiling while playing Rare Replay as my face started to hurt. 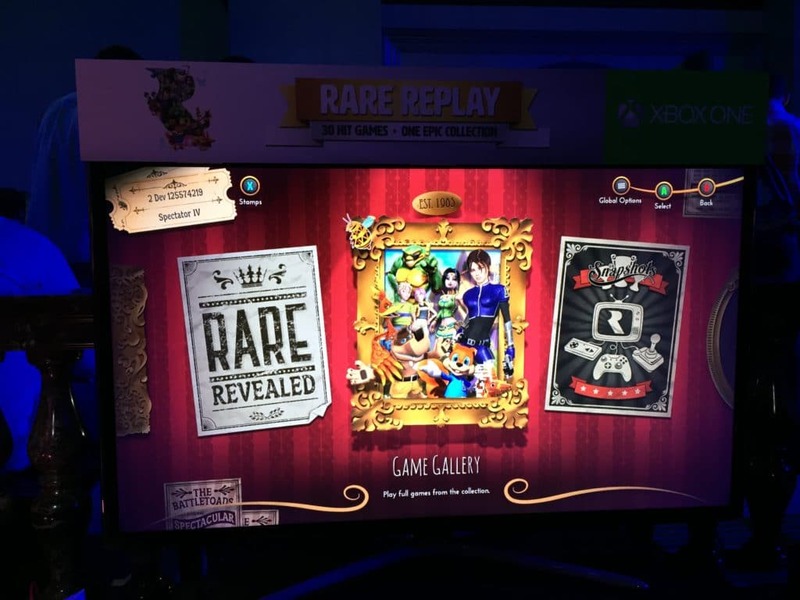 The older games in the collection will launch inside of Rare Replay, while the newer games will launch as standalone games. Rare uses the recently-announced backwards compatibility feature to launch the 360 titles, including the Banjo-Kazooie XBLA games. Some titles in the collection even got a little more love since they were originally released. Grabbed by the Ghoulies now runs at 1080p 60fps! As if this weren’t enough, you really realize that you are getting so much more from Rare Replay than just the games when you delve into the special features section. It is chalk full of developer interviews that have never been seen before. As I talked to the developers, it sounded like many were recorded just for the game. There are videos of cancelled games and even unreleased prototypes! If anyone was wondering what Black Widow was and how it played, there is a juicy video waiting for you with an intro by the ever-hilarious Chris Allcock. The video goes into great depth! Another awesome feature added to the older games is something called Snapshots. Snapshots are best moments of certain games that Rare has used to create mini-games for extra challenge. For instance, there is a Snapshot challenge for Battletoads where you ride down an infinite Turbo Tunnel trying to see how long you can survive. As a Rare fan this collection is more than we could have asked for. Getting 30 Rare titles all in one package on our Xbox One would be amazing enough but the huge amount of bonus content filled with thought and love from the developers is a dream come true. As someone not so familiar with Rare this collection is just a great value and a great chance to play some of the highest critically and socially regarded games created. After the trailer for Rare Replay ended Craig Duncan, the Studio Head of Rare, walked on stage to announce their brand new game: Sea of Thieves. The trailer starts and right away you are met with an amazing, atmospheric jungle island. The game is in first person. The great Robin Beanland’s pirate track is heard as player explores the island. The game is colorful, vibrant and has a unique art style that definitely shows the Rare charm. This is in large thanks to Ryan Stevenson who also inspired Viva Pinata’s art style. As the player explores more we see this game will have pirates. All of a sudden another human controlled pirate runs by and the player follows them into a cove with a huge docked pirate ship. The trailer cuts to the player being on the ship and we see a gorgeous sea surrounding the player on the ship. Beautiful waves crash against the bow and another pirate ship approaches. Is this ship friend or foe? Well, we shortly find out as cannonballs are fired back and forth between the ships. Both ships have multiple human controlled players on them. Player names appear over their heads suggesting an MMO-like experience. We see some players hoisting the sails, some manning cannons. We even see a group of players forcing another player onto the plank to meet their demise of being lunch for a few sharks! So it appears: Rare is making a huge pirate themed multiplayer type game. Later, I met with Gregg Mayles (Design Director), Mike Chapman (Lead Designer) and Joe Neate (Executive Producer). 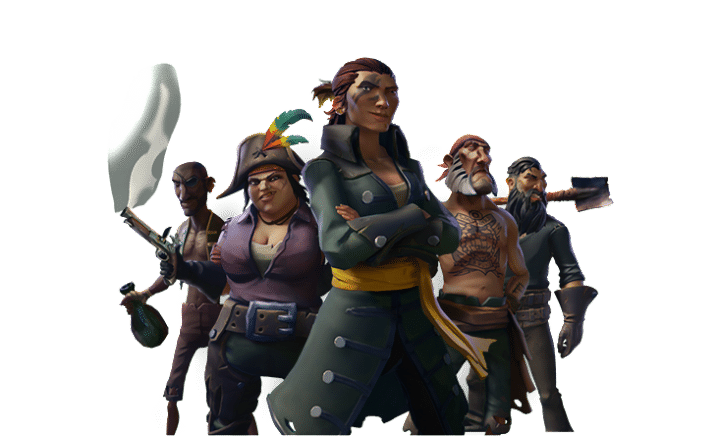 They have all been working hard on Sea of Thieves but also having tons of fun on this game. 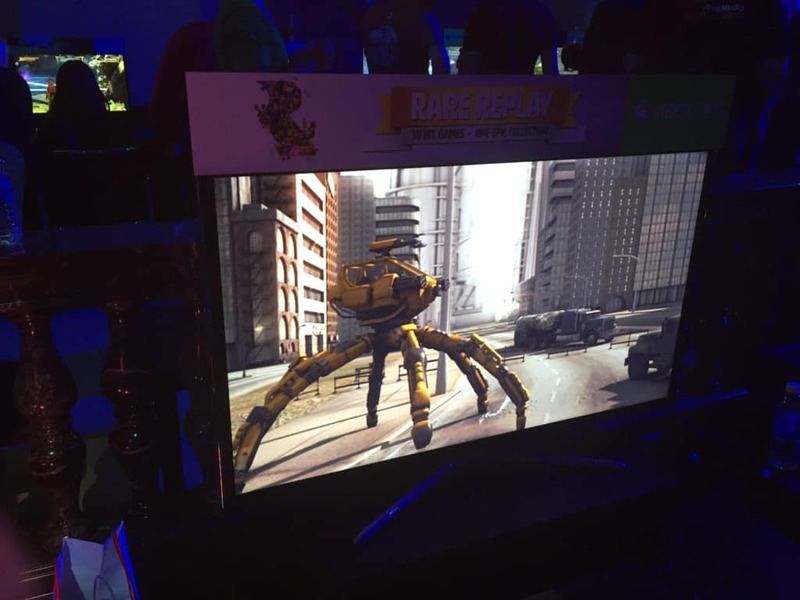 They asked if it was what I was expecting to see from Rare this E3; honestly, it wasn’t. They all smiled when I said no, and said that is exactly what they wanted to do, surprise everyone. I asked if they were inspired by any games while designing Sea of Thieves and they said they tried not to be inspired by any other games during development. The team didn’t want the unneeded stress of comparing their game to other massive multiplayer games out there and also didn’t want their creativity hindered by trying to match other game’s features. On the topic of other massive sandbox multilayer games: for those wondering, there will not be any zombies. The game will have plenty of dead skeletons to fight though! Gregg, Mike and Joe were all exuding so much excitement and talked about how much fun the team is having creating this game. Mike mentions this is the type of game he dreamed of making. As a fan this is a dream come true as well. Rare games to me have always been about exploration, great atmosphere and fun. From this little bit of gameplay we saw Sea of Thieves looks to encompass all of these things. Lots of our favorite Rare games have pirate themes included in them and it is super fun and exciting to see a whole game based on this theme. 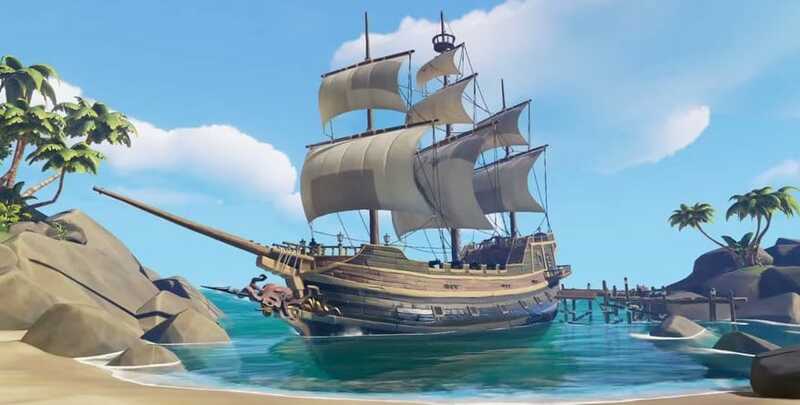 When you start to imagine all the possibilities this game offers you can see why Gregg mentioned earlier this year that Sea of Thieves is one of the most fun games Rare has created. Sea of Thieves will be released on Xbox One as well as Windows 10 and uses Unreal Engine 4. There is no word on a release date yet but holiday 2016 has been mentioned a few times. This year at E3 Rare made its presence more than known. The newly branded Rare logo perfectly encompasses Rare’s state as of now. Rare is embracing the old and infusing it with the new. With the old Rare classics and the brand new Rare IP, Sea of Thieves, fans of Rare and great video games cannot be disappointed.